I hiked out to this waterfall with my gear in a 20L dry bag. I found a couple of stones to put my tripod on and carefully put my gear together over the water. 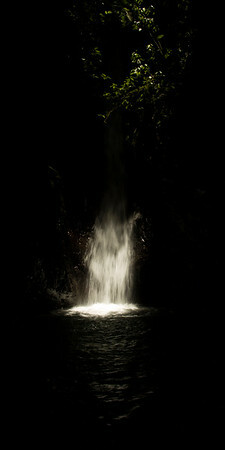 It had been raining but a ray of light came down through the jungle foliage illuminating the waterfall where it hit the water and some of the surrounding leaves. I find this to be a hopeful picture what were the chances that the light would line up so perfectly!